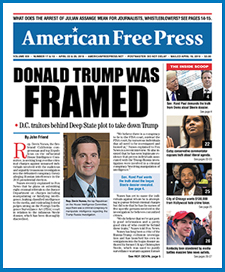 American Free Press Issue 31&32 has been sent to the printer, and digital subscribers can read the issue online now. (Log in here if you’re a subscriber; click here to view options if you’re not yet a subscriber.) The front page article of this issue is from AFP’s editorial team. With the July 27 announcement that the U.S. economy had grown by over 4%, the mainstream media has been forced to concede that President Donald Trump has had a banner first term pushing through his America-first agenda. Even CNN, often called the “Clinton News Network” for its non-stop sycophantic coverage of the Clintons, this month had to admit that it’s a “golden age” for Trump. So let’s take a moment to acknowledge what Trump has accomplished in the year-and-a-half he has been in office. The U.S. unemployment rate—tracking only Americans actively involved in the workforce, not those who have given up or are under-employed—has dropped to 3.8%. Even the broadest category of unemployment—U-6, which the Bureau of Labor Statistics explains tracks “all persons marginally attached to the labor force”—is at 7.8%, a good indicator of how many Americans are actually working today. Those numbers are especially strong for minorities. For example, less than 8% of black Americans are jobless today, the lowest reported rate since the early 1970s. Trump’s administration has been quietly packing the courts with conservative judges, including two new Supreme Court justices—Neil Gorsuch and Brett Kavanaugh. Even the mainstream media has been forced to concede that Trump is winning when it comes to revamping the judicial system. Fortune magazine reports that in the next two years, if Trump stays on pace, he will likely be able to fill over 200 of the nearly 900 seats in the judiciary. “And since 39% of his nominees will replace judges appointed by Democratic presidents, his picks will undoubtably move the judiciary to the right in ideological terms,” reported Fortune. How did Trump rise to the presidency? Learn the story from these insiders. Now 20% off regular price at the AFP Store. When it comes to world affairs, Trump is moving ahead with his America-first agenda. Last month, Trump visited Europe where, for all of the world to see, he tore into the European Union leaders, arguing that they unfairly protect their economies while stacking the deck against the U.S. Outwardly, Europe’s elected and unelected leaders bristled at Trump’s remarks, but quietly they all sat down at the table to discuss ways to erect a fairer system of trading for everyone involved. Trump also lambasted wealthy Europeans for fleecing Americans to pay for their defense via NATO, according to which the U.S. is required to pay a ridiculous 4% of U.S. gross domestic product defending Europe from a non-threat while those same countries pay a pittance. While the big media—funded by globalists who make billions off U.S. military overspending—raged at Trump for threatening to quit NATO, there was no doubt that the president’s tough talk resonated at home among working-class Americans. These are but a few of the victories that the current occupant of the White House is securing for the United States. The next time the far left goes off on Trump, let them know that Americans are moving ahead with or without them, as the current administration finally takes steps to put America first.